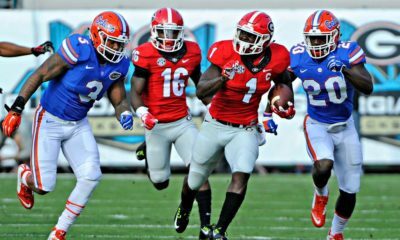 The Georgia Bulldogs raced out to a 20-0 lead in the 2nd quarter and then held on to defeat the Florida Gators 23-20. It was the third straight victory for Georgia over Florida. Running back Todd Gurley returned to action for the first time since injuring his ankle vs. LSU. 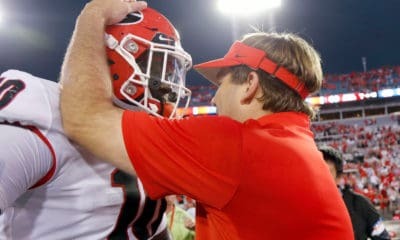 On Georgia’s first two possessions, Gurley accounted for 18 yards rushing, 103 yards receiving and two touchdowns as the Dawgs shocked the Gators with 14 straight points. After three Marshall Morgan field goals, the Bulldogs took a 23-3 lead into halftime. Florida got the ball first in the second half, but missed a 47-yard field goal. On Georgia’s ensuing possession, Aaron Murray attempted to throw a screen to tight end Arthur Lynch, but the pass was dropped by Lynch and ended up being ruled a lateral. 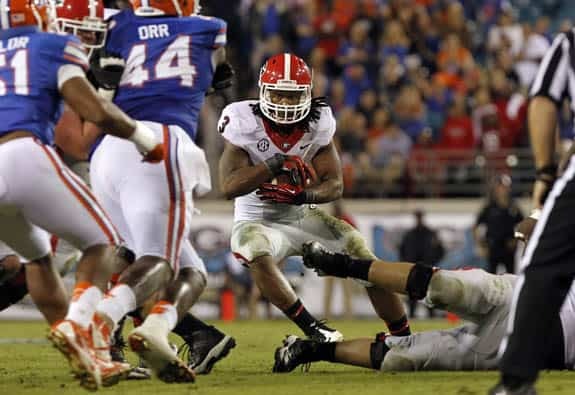 Instead of recovering the ball, Lynch agonized over the drop while Florida’s Leon Orr jumped on the ball. Two plays later, the Gators rushed for a touchdown to cut Georgia’s lead to 23-10. 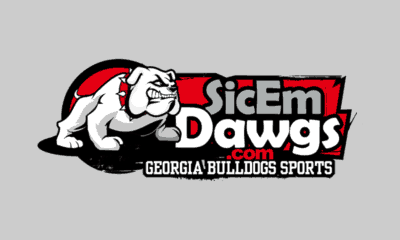 Later in the 3rd quarter, Murray was sacked in the end zone for a safety, which made it 23-12 Dawgs heading into the fourth quarter. Gator quarterback Tyler Murphy would then rush 14 yards for the TD, and then successfully converted a pass to Clay Burton for a two-point conversion to make it 23-20 Georgia with 14:20 remaining in the game. Aaron Murray finished the game 16-of-25 for 258 yards and one touchdown. Murray, who also rushed six times for six yards, is the first UGA quarterback to lead the Bulldogs to three consecutive wins over Florida since Buck Belue. Todd Gurley led the Dawgs on the ground with 100 yards rushing and a TD on 17 carries. He also caught three passes for 87 yards and a touchdown. Brendan Douglas added 36 yards on six carries. Michael Bennett returned to action to lead all receivers with five receptions for 59 yards. Rhett McGowan had three cathes for 43 yards, while Arthur Lynch added one catch for 31 yards. Overall, Georgia finished with 414 yards of total offense, 258 passing and 156 rushing. The defense held the Gators to 319 yards of total offense, but didn’t create a turnover. 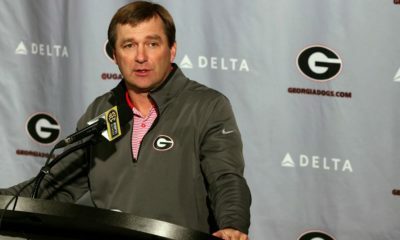 But more importantly, the defense held Florida scoreless in the first half when the Bulldogs went on a 23-0 run to essentially put the game out of reach. Next up for Georgia (5-3, 4-2 SEC) is their homecoming game against Appalachian State on Nov. 9. The game will be televised by WSB-TV Channel 2 (ABC) at 12:30pm ET.